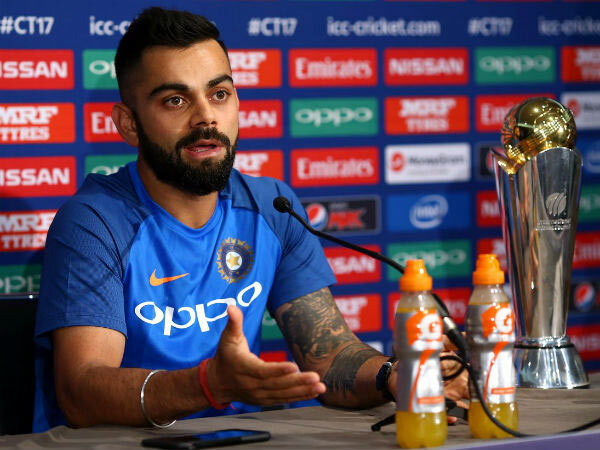 India captain Virat Kohli has given reasons for not bowling Yuvraj Singh against Sri Lanka in the Champions Trophy 2017 match yesterday (June 8) at The Oval. Sri Lanka defeated India by 7 wickets in a Group B encounter as the Kohli-led side failed to defend 321. Indian bowlers managed to take only 1 wicket and other two successes came via run outs. When Kohli was asked why he did not use the part-time spin of Yuvraj, the skipper said he too, like Ravindra Jadeja, would have found it difficult. Jadeja went for 52 runs in 6 overs. “See, if the team is four or five down and you have to get few overs out of the way from the part-timer, then Yuvi can be used, but at that stage, I did not think – because Jadeja was also going for runs, and it was difficult to bowl with the breeze going that side to the shorter boundary. If Jadeja is finding it difficult, then obviously Yuvi would have found it a bit more difficult as well,” Kohli said at the post-match press conference. He said he consulted Mahendra Singh Dhoni and brought on Kedar Jadhav to bowl. “I thought – I spoke to MS (Dhoni) as well, and we both thought that Kedar (Jadhav) was a better bet at that time. Then because in England, generally, if you bowl little seamers, then you can trouble the batsman. So I thought why not try a few overs there as well? So I think we covered up pretty well. Wicket is a bit more dry than, which obviously comes into contention and I don’t. “From that point of view, I think it was depending on the kind of situation we had in the game and what was going on on the pitch. The spinners are finding it difficult when we were bowling anyway. So I don’t think that that would have been a wise decision at that stage,” he added. India now face South Africa in their final group game on Sunday (June 11). It is a virtual quarter-final as the winner goes to the semi-finals. In case of a washed out contest, India, the defending champions, will progress.